Here is another felt doll/statue! It's Our Lady of Lourdes and she's perfect to make and/or display on her feast day- Feb 11th. This doll/statue is a project that will require some assistance from older crafters who can use a hot glue gun to add the gold trim to Mary's veil. Or if you sew, you could sew it on, too! white felt head covering * the head covering for this doll is floor length so don't follow the pattern. Make it long enough to cover her head and reach to her "feet". 2 tiny roses for her feet ~we used the gold ribbon to make them, but you can buy some. 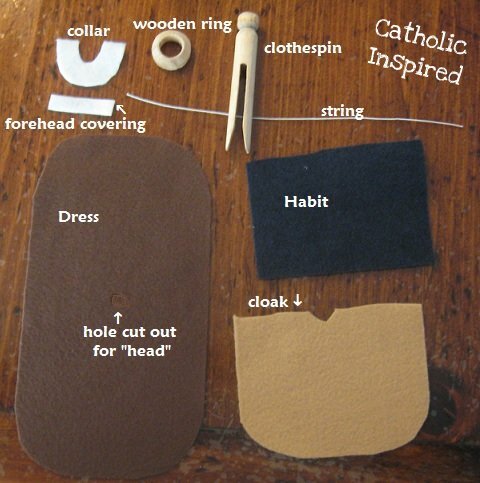 After cutting out your felt pieces, push the round clothes pin head into the small head hole in the dress. You may need to add a drop of hot glue at the upper chest and upper back of the doll clothespin to keep the dress from sliding down the clothespin. Pull all the dress parts down against the clothes pin and tightly knot the ribbon around its waist. 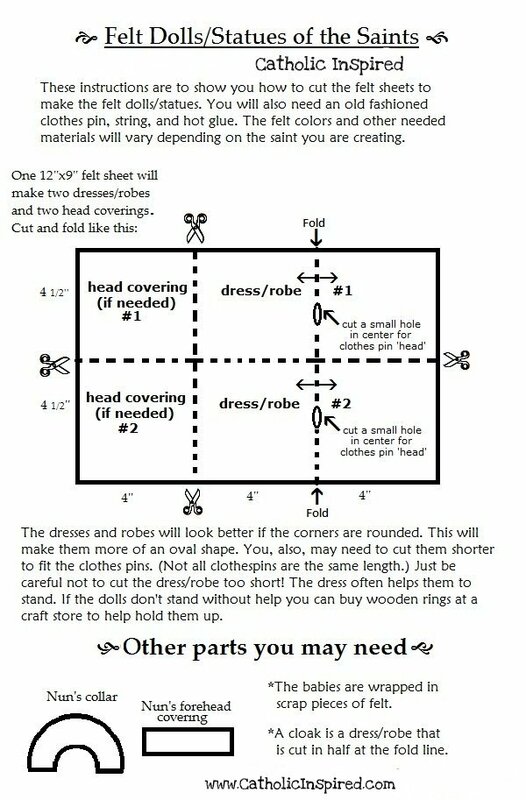 You may need an extra hand to hold the dress down while you knot the waist ribbon. Make sure the extra is hanging in the front of her. 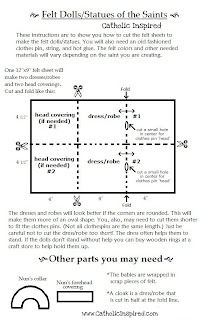 (as pictured on the completed doll) If the dress is too long, cut it to the correct length. If the opening on the sides of the dress are showing, hot glue it together. Add hot glue to the top and sides of the dolls head and cover the top of her head with the head covering. Note: You may have to cut a slit in the back of the veil, (from the bottom of the veil up to the head) so it will lay down properly. Then hot glue the back of the veil down in a way so you don't see the cut. Now, cut the front of the veil so the corners are rounded. Add some hot glue to the front edge of her head covering/veil and add the gold ribbon. Now for the final touch add two mini roses to the bottom edge of her dress, as pictured. If the doll has trouble standing on it's own hot glue a wooden ring to the bottom to stabilize her. Now you're done! I'm sure she's beautiful! darling. I like that you show a tutorial step by step. thanks for sharing!! So cute! And thank you for the wonderful instructions! Even I can follow them!!! Thank you for sharing on NOBH! I am in love with all of your felt saint statues! I'm going to attempt to make an Our Lady of Guadalupe saint statue from these instructions. Thankyou for your beautiful inspirations!! I thought that seeing a picture might help you.